LIPAN (ATF-85) was laid down 30 May 1942 by the United States Engineering Company; and commissioned 29 April 1943, Lieutenant F.W. Beyer in command. 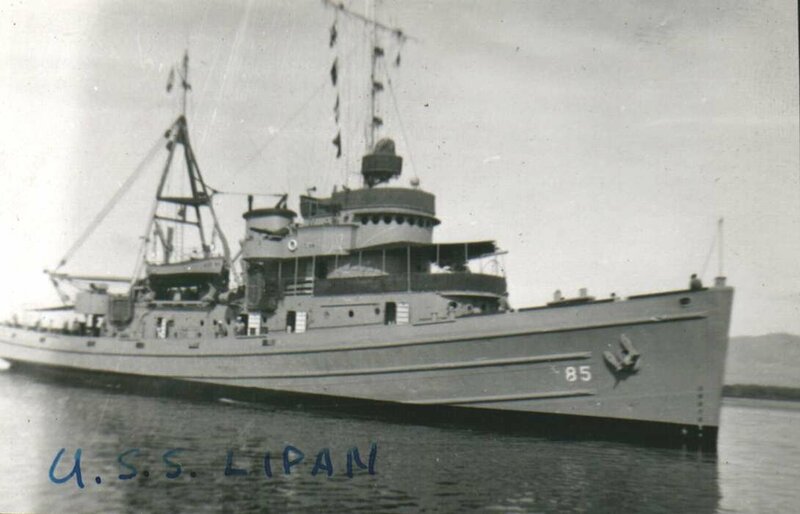 Transferring to Guadalcanal 6 December, Lipan was redesignated ATF-85 (fleet ocean tug) on 13 April and operated in the Solomons during the first half of 1944. Lipan departed Guadalcanal 4 June with Rear Admiral Riefsnider's Southern Transport Attack Group for the scheduled attack on Guam. When the invasion of Guam was postponed by the battle of the Philippine Sea, the ship joined Service Squadron 10 at Eniwetok 3 July. Departing 8 July, she arrived Saipan 15 July and remained under constant enemy fire until 20 July, then rejoined Admiral Riefsnider's group at Agat Bay, Guam, on D-Day, 21 July. Lipan rescued landing craft grounded by the treacherous surf surrounding Agat Bay. Returning to Eniwetok 30 September, she sailed for Ulithi with two boats in tow on 12 October, arriving on her destination on the 20th. Taking Houston (CL-81) in tandem tow with tug Arapaho (ATF-68), the ship sailed 14 December for Manus and arrived 21 December. Dropping the tow, she immediately set course for home and made San Francisco 9 January 1945. As the Japanese intensified the suicide attacks in a costly but futile campaign to hold Okinawa, the tug undertook salvage and firefighting duties. For over 2 months, as the salvage attacks continued, Lipan salvaged and rescued damaged Navy ships while she was towing the already salvaged Barry (APD-29) to Ie Shima, escorted by LSM-59, two suicide aircraft attacked the convoy. One immediately crashed and sank LSM-59. The second barely missed Lipan and crashed Barry which sank the next day. The ship departed for overhaul Leyte 19 july and arrived 1 August. Overhaul completed after V-J day, she departed for a supposedly peaceful run to Okinawa, 23 September, with two boats in tow. While Lipan was on route 30 September a typhoon with 50-foot seas and winds over 100 knots battered the tug with 55-degree rolls, snapping the tow, and starting a fire which destroyed the propulsion panel and the lower motor room. After riding out the storm, she made Subic Bay 7 October. Following extensive repairs, Lipan sailed for San Francisco 3 December. During the postwar years, Lipan towed gasoline barges, landing craft, disabled submarines, floating dry-docks, and target sleds. With the outbreak of the Korean war, Lipan departed for Long Beach for the Orient 20 June 1950. She then steamed with TF 90 for Ichon Harbor for the brilliant flanking amphibious assault. As the landing forces swept ashore, and caught the North Koreans completely by surprise, the tug cast off her pontoon tows, and began various towing and salvage assignments. Near Wosan 1 November, Lipan planted channel buoys, retracted 23 damaged LST's from the beach, and recovered lost anchors in the Wonsan harbor, then steamed north and laid buoys at the Hungnam Harbor and Songjin Harbor. Returning to Wonsan 26 November, she left the next day for Sasebo, Japan, and arrived the 30th. For the next two months, the tug towed Army pontoon bridges from Inchon to Taechon, Korea, or back to Sasebo. After a 3 month overhaul and towing missions to the Marshall Islands and Subic Bay, Lipan departed Hawaii 26 November 1951 for a 6 month tour of duty at Apra Harbor, Guam, then returned to Pearl Harbor 9 June 1952. For the next 11 months, she again operated between Hawaii and the Marshalls. On 2 May 1953, the tug left Pearl Harbor for towing duty between Sasebo and various Korean ports. She returned to Hawaii 19 November. Based at Pearl Harbor from 1954 on, the tug has continued to meet the towing and salvage needs of the Pacific Fleet from the west coast to the western Pacific. Lipan was acquired by the Coast Guard in 1980. Lipan received two battle stars for World War II service and for battle stars for her Korean service.